Casuarina Bay is an exceptionally beautiful, secluded hideaway on the island of Eleuthera, in the Bahamas. Just two lovely properties share this very private protected bay on the Atlantic, skirted by miles of pink sand beaches. Easily accessible, Casuarina Bay is just one hour by air from Fort Lauderdale, and only seven miles from Governors Harbour airport. It is located 1.5 miles northeast of the quaint village of Governors Harbour, one of the oldest settlements in the Bahamas. The house has spectacular views of the Atlantic Ocean, amidst a picturesque grove of coconut palms, colorful hibiscus, fragrant frangipani flowers, sea grape, passion fruit, papaya and Casuarina trees. Ocean-lovers will find some of the best snorkeling, scuba diving, and swimming in the world. Underwater visibility is up to 100 feet, with water temperatures ranging between 70 and 80 degrees Fahrenheit. More information and many more photos are available on our website. The link is located at the bottom of this page. The adventurous traveler can explore nearby islands and virgin coral reefs, swim with dolphins or exotic tropical fish, or charter boats for world-class bone or deep-sea fishing. Other sports available on the island include tennis, and surfing. This beachfront vacation cottage is built of cedar in an open hexagonal design, with a high ceiling and a sleeping loft, ideal for children. Eight arching windows provide magnificent views, and open onto a wrap-around deck with ocean views. There's a split level A/C unit. On the beach we have a thatched cabana with comfortable lounge chairs. Perfect for a honeymooning couple or a small family, this rustic Round House is charmingly and comfortably furnished, and has been described as 'the hidden treasure of Eleuthera'. This is the perfect place for the adventurous traveler and for those who enjoy taking in the exquisite beauty of this magical island. This 110 mile long island offers many fascinating places and deserted beaches to explore. 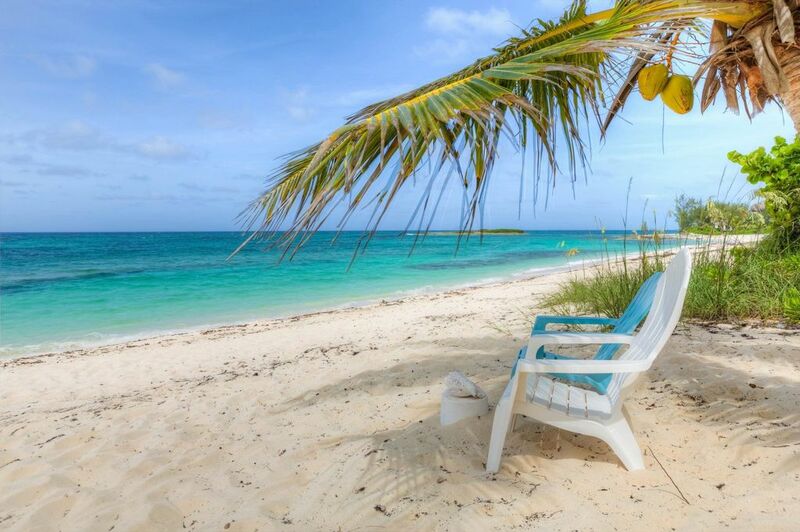 The quaint island of Harbour Island is 1.5 hours away; Nassau and Paradise Island are 20 minutes by plane. The village of Governors Harbour offers a variety of restaurants, bars, food, liquor, gift shops, a cinema, hotel, post office, clinic, dive shop, and car and bicycle rentals. Spend days walking or lazing on secluded pinks and beaches or exploring the coast with our ocean kayaks. Snorkel for hours right in front of the house on the pristine coral reefs. Catch your own lobster and feast on them while watching the full moon rise out of the ocean. Awake to the gentle sound of the breeze rustling through the coconut trees. The McKinney family has lived in The Bahamas for generations. When she was seventeen, Doon was teaching school in a remote village in Botswana. She fell in love with the idea of living in a round house. When she returned to The Bahamas she decided to move from Nassau to the remote and untouched island of Eleuthera and build her own round house on a 14 acre sea to sea estate running the entire width of the island. Everyone was a bit skeptical of this young woman clearing the land by herself and building a house with no electricity, running water, car or a telephone. Camping out every night on the site helped her develop an intense connection with the land and gave her the opportunity to build a house that was perfect for the location. She decided to build 11 foot arches on all five sides of the house to allow the ocean breeze to sweep into the house. She nestled the house among coconut trees and Casuarina trees where you can hear the sound of the wind in the trees and the waves on the beach. She surrounded the house with a garden full of beautiful hibiscus, oleander, seagrape, coconuts and other native flowers and trees. It was a challenge for a woman with limited carpentry skills to clear the land and almost single-handedly build a house- having never built so much as a box. Doon persevered and used creativity to overcome many of the obstacles she encountered. While still working on the building of the house Doon married and had 2 daughters (Casuarina and Taja)- Taja was born right in the Round house before the midwife even found her way out to Casuarina Bay. The location of the Round House is second to none. You enjoy ocean breezes throughout the house and the private thatched cabana offers stunning views to the beautiful beach. One can walk to excellent beaches right from the front door. Including French Leave, just 5 minute south and Twin Coves 5 mins walk north. The house is 50 feet from a beautiful sandy beach with private cabana. Wifi- Iphone with hotspot provided. Bath and beach towels provided. Private yoga deck in the garden. We do have a rental car which we book with the house- please email to inquire and we can have the car waiting for you at the airport. New yoga deck recently completed on the property. Loved the location down the sand (not dirt!) path and the private beach. The home is great and you can hear the ocean waves from the bed at night. Only issue we had was that the bathroom shower is a bit old and needs to be carefully adjusted. The couches were quite old and not great but certainly usable - especially since it's on a small island I'm sure there are not a ton of ways to get new furniture there. Would definitely return. The homeowners were very responsive and helpful! Our family of 4 stayed in the round house in February 2019 and absolutely loved it! We were looking to enjoy a nice relaxing vacation and that is exactly what we got. The island of Eleuthera is a hidden gem. The beaches (which you almost always have to yourself) are absolutely beautiful, the locals are very friendly and the island is safe and so much fun to explore! We really enjoyed getting to know Doon during our stay and the kids loved playing with Bimini (her dog) every day! I highly recommend a vacation to Eleuthera! We can’t wait to go back! We are thrilled that you loved our Round House and your visit to Eleuthera. We hope that you can return soon. We really love the rustic charm of the Round House, a hexagonal hand-hewn cottage with a warm ambience you don't find in a typical rental. We had the gorgeous, long beaches almost to ourselves, and when it was windy on this side, we just drive a short distance to a calmer beach on the East side. The owner, Doon, is an absolutely lovely person, who has lived there for many years, and is active in preserving the natural wonders of the sea and land of Eleuthera. This place is a unique treasure! This is our third year at the Round House and we can't let go.....it is the BEST place to stay in Eleuthera! My fiancé has gone on a kayak (fishing), in front of the home, and has caught blue runners, yellow jacks and yellow tails!!!! How cool is that? Not only that, there is the best snorkeling also in front of the home...less than 10 feet from shore! Don't this twice...this is the place to stay! This was our second trip to the Round House and it did not disappoint. The house was perfect for the two of us, but could accommodate kids as well, or friends as long as you are ok with an open concept living and sleeping space. The views from the house are great. You can see the ocean from the front, and lush forest in the back. The weather was beautiful and we spent quite a bit of time in the beach cabana, my favorite spot! On a day it was a little windy we went to a Caribbean side beach (Cocodimama), and would also recommend Gaulding Cay on the Caribbean side. We used the kayaks as well. The beach right in front of the house has very little traffic, and the cabana is nicely hidden from the road - despite what other reviews say. We walked up to Twin Coves for snorkeling and fishing, and walked down to French Leave beach as well. Doon was an excellent host, just like last time, and she even brought us a fresh papaya that was growing outside our back window. Doon also gave us a great recommendation to go to Tippy's on Wednesday night for the live music. The food and music were both great. You can walk to Tippy's or it is a short drive. We walked and had a nice moonlit walk back. The location is very close to town, but you would never know it because of how few people you see when you are actually at the house. This house is not a ritzy, super modern, hotel style property so don't come expecting that. It is very homey and well kept. We had everything we needed. The wireless worked fine for our needs - quick checks on the kids back home, etc. This is a place to go to get away from it all and enjoy the beauty of Eleuthera. We highly recommend the Round House! I would love to go back! I loved our stay at the Round House. We took our two teenagers (14 and 16), some snorkeling gear, fishing rods and books. The opportunity to share a one room (with loft) round house was exactly what we needed to secure quality family time. The beach in front of our house was stunning and extremely quiet. A short walk to the south is access to French Leave Beach, one of the most beautiful in the world. We ran or walked it every day. Twin Coves to the north provided interesting tide pools and snorkeling opportunities. Governor's Harbour is only a 15 minute walk or a couple of minutes by car. Bikes would be a nice addition to the property for this purpose. Decent food, groceries and coffee in the Harbour. Really enjoyed the Globe Princess movie theater. Super special to stay in a house that was built by the lady next door. Doon is a gem and we enjoyed learning about her family history and life on the property. The Round House was a great place to stay for a more authentic experience in the Bahamas. Outdoor shower was also a personal favorite. Eleuthera- a 110 mile long island, offers many fascinating places and deserted beaches to explore. The island Harbour Island is 1.5 hours away; Nassau and Paradise Island are 20 minutes by plane. The village of Governors Harbour offers a variety of restaurants, bars, food, liquor, gift shops, library with internet, a cinema, post office, clinic, dive shop, and car and bicycle rentals. We have 2 sit- on-top ocean kayaks at the house for you to you explore the coast and even snorkel from. The adventurous traveler can enjoy nearby islands and virgin coral reefs teeming with exotic tropical fish, or charter boats for world-class bone or deep-sea fishing. Other sports available on the island include golf, tennis and surfing. $100 weekly charge for each guests in excess of 2 guests. Children 6 and under 6 are free. $75 one time pet fee. Cleaning fee $125. Security deposit: $300 Car rental available at $495 per week or $70 per day.